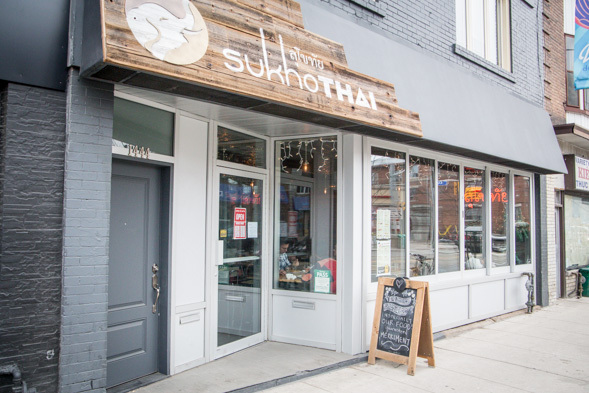 Sukhothai on Dundas West is the third location of this little Thai restaurant that could. With humble beginnings starting out as a small Corktown hole-in-the-wall , it became so popular that a second, larger and swankier location on Wellington East followed, along with offshoots Khao San Road (now no longer affiliated with this mini empire), Sabai Sabai , Pai and a soon-to-open Vancouver outpost called Kanchanaburi. The secret behind the successes of these eateries is chef Nuit Regular , whose authentic Thai recipes have won over Toronto diners (the proof is in our best-of list ). She operates the restaurants with her husband Jeff and his family, and it was Jeff's brother Joel who suggested they open a location in this part of town. Now Joel runs this place (in addition to working as an art director). Although this is the third Sukhothai, it's the first to venture this far west to Little Portugal (the other two are east of Yonge), taking over the 60-seat space formerly occupied by The Guild . 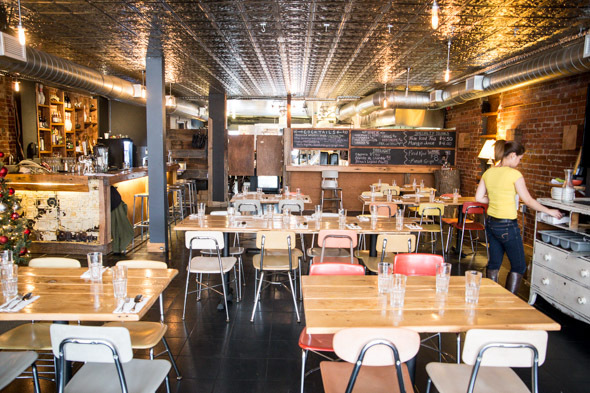 It still looks a lot like the short-lived brunch spot inside, with the exception of a few minor decor tweaks. In terms of size, it's larger than the original Parliament Sukhothai but smaller than the one on Wellington East. Like the latter, this one has a liquor license, so you can enjoy a bottle of Chang or Singha ($6 each) with your meal. There are also specialty cocktails like the mango margarita ($10), which is a tropical mix of Olmeca tequila, mango, ginger beer and cilantro. 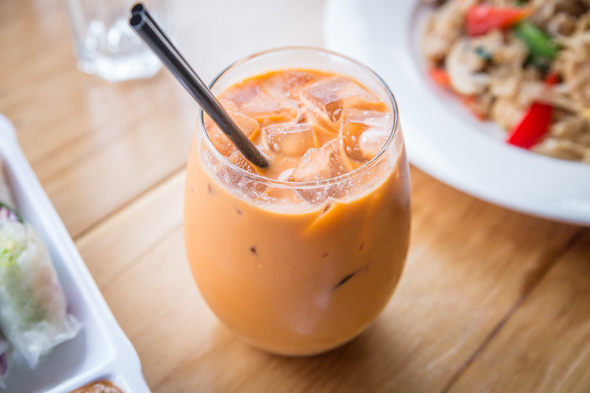 If you're more in the mood for caffeine, the Thai iced tea ($4.50) is my go-to non-alcoholic Thai beverage of choice. 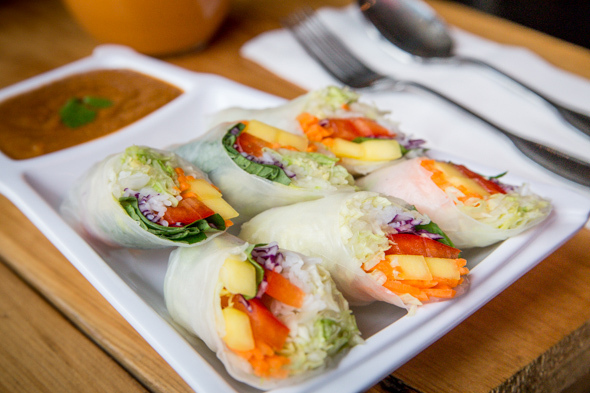 For starters, there are fresh veggie rice paper rolls (3 for $6) containing a colourful array of veggies - plus mango and basil - accompanied by a peanut dipping sauce. 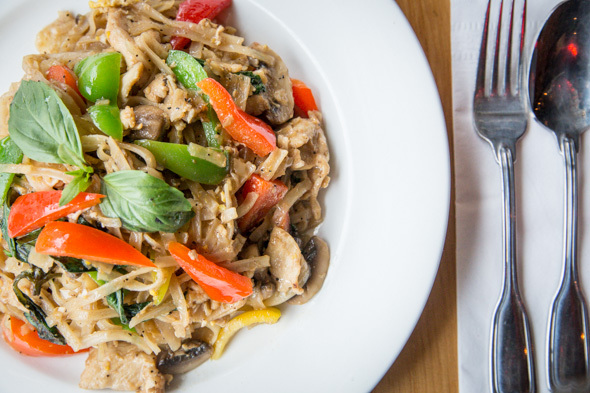 Since a lot of Thai cuisine is rice-based, there are a lot of gluten-free and vegetarian options to choose from here. An item that's unique to this location's menu is the calamari ($9), which arrives on a bird's nest-like bed of crispy noodles. 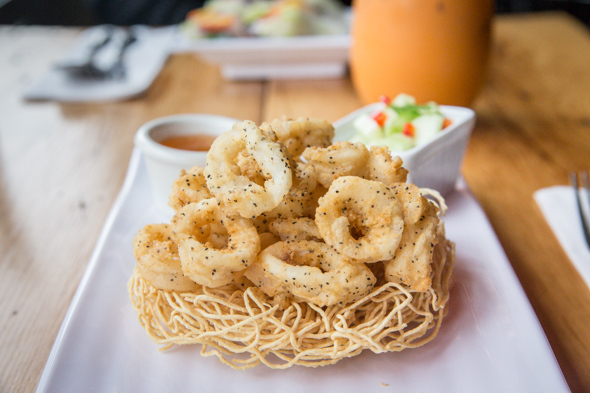 These addictive, peppery bites of deep-fried squid come with a sweet and spicy sauce as well as a small salad of chopped red pepper and cucumber, a refreshing side to balance out the spice. When it comes to mains, the pad kee mao (drunken noodles) with chicken (or beef or tofu, $12; $13 with shrimp), is good, but not mindblowing. The rice noodles are a little too overcooked/mushy for my taste, but the flavours are spot-on. My only complaint is that I find some of the chunks of beef a bit tough to chew, but it's not enough to detract from the joy of reliving my experiences eating this stuff when I visited Chiang Mai . 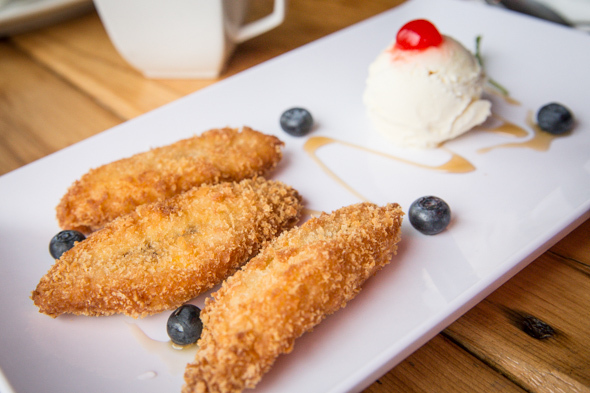 Dessert options include cassava cake ($4) and tapioca with coconut milk ($4), but we go with the fried banana with ice cream ($6), a classic way to finish things off. That and some lemongrass tea ($3) make for a satisfying conclusion to this visit - almost as satisfying as knowing there's finally a Sukhothai on the west side.